A distinguished philosopher and Buddhist leader, H.H. Grandmaster Lin Yun was one of the world’s foremost authorities on Feng Shui. The PBS show, “Feng Shui: Creating Environments for Success and Well-Being,” is based on his teachings and is the first major TV program on the subject for a Western audience. H.H. Grandmaster Lin Yun used Feng Shui to help heads-of-state and corporate executives raise profits and lower stress for more than fifty years. As spiritual leader of Tibetan Tantric Buddhism of the Black Sect, he met with world figures including the Pope, the Dalai Lama and Charles, Prince of Wales. Born in Beijing in 1932, Tibetan lamas “discovered” H.H. Grandmaster Lin Yun’s spiritual gifts when he was six. They took him under their tutelage at the famous Yon-he Buddhist Temple. For nine years, they taught him Black Sect Tantric Buddhism and later Feng Shui. At seventeen, he left China for Taiwan and continued his studies with Buddhist scholars. A household name in Taiwan and Hong Kong, H.H. Grandmaster Lin Yun was the founder of Black Sect Tantric Buddhist Feng Shui, sometimes referred to as the “Modern School of Feng Shui” because it adapts this ancient practice to modern living. Black Sect Feng Shui incorporates science, architecture, environmental design, psychology and other contemporary disciplines in its analysis. H.H. Grandmaster Lin Yun’s teachings were comprehensive, philosophical and spiritual, a synthesis of Confucianism, Taoism, Buddhism, Feng Shui, I-Ching and folklore. He taught thousands of students in Asia, Europe, Latin America, Australia, and the United States. He was largely responsible for its popularity in America and trained many of its Feng Shui practitioners. A distinguished philosopher and Buddhist leader, H.H. Grandmaster Lin Yun lectured at universities throughout the world, including Harvard, Yale, Oxford, universities of Munich, Beijing, and Scandinavia. A lifetime of study and meditation infused him with profound spiritual insight and abilities. "After a slowdown in my company, we implemented the Feng Shui remedies that Deborah recommended for my business and home. During the year, my business increased 85%, my husband's health significantly improved and there's an indescribable harmony to our home. Deborah brings powerful benefits through her work that only a master practitioner can deliver." "I have a lot of trouble sleeping, so Deborah focused on making Feng Shui changes in the master bedroom. After we painted the red accent wall to a soothing green, changed the side of the bed I was sleeping on and did a few other remedies, I had such a great sense of comfort and healing. I sleep better and communication with my partner is so much better." "I am a mortgage banking manager for one of the largest banks in the world. Since I met Deborah over 10 years ago, my life has completely changed in the most positive way. I have consulted with her for my workplace and house. We are truly enjoying great success, love, harmony at work and at home. I have recommended Deborah to many of my friends, and they ALL love how she has helped them!" Characters for "Feng Shui" - literally meaning "Wind & Water." 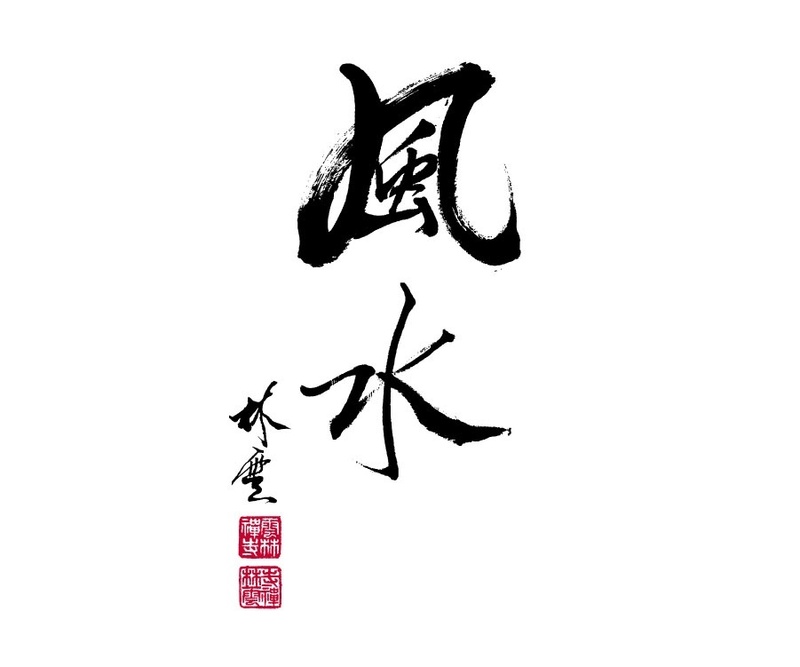 Calligraphy by Grandmaster Thomas Lin Yun.